Christ the King Church is closed for redecoration and will reopen on Saturday 15th November. This week has involved completing work on the floor of the church, especially the sanctuary. Attendance last weekend was 177 with £390.08 in the collection. Thank you for your generosity. We will be beginning to prepare music for the Christmas Liturgies and we are also hoping to have a Carol Service during the Christmas Tree Festival on 12th December . We have also been asked to do some Community Carol Singing (details to follow). If anyone is interested in joining us for this, there will be rehearsals at Christ The King on Sunday 23rd November, Sunday 30th November and Sunday 7th December, all beginning at 6.30 p.m. Please come along. Churches Together will be organising a Soup Run, November to February. The organisers need volunteers to help make the soup and / or help serve food from the van. They plan to go out in the city 7.00-10.00pm. Demand will determine how many nights they operate. Person to contact: Mark Sellers: 01228 520898 / 522605. Come and See! Becoming a Catholic. The group will next meet on Tuesday 4th November at 7.30 pm in the Presbytery at Christ the King. Please pray for the seven people discerning their journey in faith. This week’s theme is Salvation History. Please remember that there is a collection point for items for the LIFE Baby Store. Newborn nappies and baby wipes are items that are particularly in need. The month of the Holy Souls will soon be upon us. We will have our annual Novena of Masses for the Holy Souls following the commemoration of All the Faithful Departed on Monday 3rd November. If you would like members of your family and friends included in this Novena, place their names in the envelopes provided for this purpose and hand them to Fr. Michael. Blessing of Graves and praying for those buried at Upperby Cemetery. On Sunday 16th November at 3.00 pm there will be a liturgy at Upperby Cemetery to pray for those buried there and to bless the graves. Details to follow. Begins on Wednesday 5th November at 7.00 pm at St. Margaret Mary. Attendance at the sessions and at Sunday Mass is an essential and necessary component of preparing for this wonderful sacrament. For more information contact Fr. Michael. Next Sunday, as well as being the feast of the dedication of the Lateran Basilica, is also Remembrance Sunday. Fr. Norman Johnson will preside at the 10.00 am celebration of Holy Mass. Thank you for your generous response to the appeal given by Mr Chris Robson on behalf of Aid to the Church in Need. He has written to thank parishioners for their donation of £784. This doesn’t include items that have come in later. Fr. John Millar will be holding a scripture study group on Mondays in the Rectory at Warwick Square at 7.30 pm. Attendance last weekend was 194 with £395.87 in the collection. This doesn’t include the evening Mass collection. Churches Together will be organising a Soup Run, November to February. The organisers need volunteers to help make the soup and / or help serve food from the van. They plan to go out in the city 7.00-10.00pm. Demand will determine how many nights they operate. Person to contact: Mark Sellers: 01228 520898 / 522605. The group will next meet on Tuesday 28th October at 7.30 pm in the Presbytery at Christ the King. Please pray for the seven people discerning their journey in faith. Please remember that there is a collection point for items for the LIFE Baby Store. Newborn nappies and baby wipes are items that are particularly in need. Students from Newman School will also be selling LIFE Badges after Mass. Do you have a child who was born between 31/08/11 – 31/12/11? If so you are entitled to up to 15 hours per week free Nursery provision from January 2015. WE HAVE AFTERNOON PLACES AVAILABLE IN OUR NURSEY FROM JANUARY 2015. Application forms available from the School Office. Call 01228 401800. All parishioners are urged to sign a petition asking Jeremy Hunt (Secretary of State for Health) to STOP doctors authorising abortions on the grounds that an “unwanted pregnancy” harms the mental health of the woman. There is very strong evidence that the opposite is true with even the government’s own advisers saying that the evidence denies this assumption. Women are being misled and misinformed that abortion is the only solution contrary to the 1967 Abortion Act. We ask Mr Hunt to put an end to this blatant law breaking. The petition will be available to sign at all Sunday Masses over the weekend 22nd/23rd November. Meet on Thursday evening at 7.30 pm in the Committee room of the Parish Centre. The 10.00 celebration of Mass today uses the prayers from the Memorial of St. Margaret Mary. There is a brunch immediately after this celebration in the Parish Centre. Christ the King Church is closed for redecoration and will reopen on Saturday 15th November. This week has involved work on the floor of the church, especially the sanctuary. Photographs are available of the work in progress at the parish blog. Many thanks to all who came along to help prepare for the redecoration of Christ the King. Many hands make light work and there was a lot of support and help. Many thanks to those who support and attend these evenings. They take place for men on the second Friday of the month and for women on the third Friday of the month. Christ the King 149 and St. Margaret Mary 95 (244). Parishioners at Christ the King gave £388.10 and St. Margaret Mary £262.44. A total of £650.54. Thank you for your generosity. Fr. Michael makes his annual retreat this week. If you need a priest in an emergency please contact the dean, Fr. Jim Allen on 521704. Sunday 19 October, 11.00am-5.30pm, Our Lady & St Joseph’s, Carlisle. For more details contact Fr. John 01228-521509, jwmillar1@gmail.com. On Saturday 18th October, 7.30 to Midnight. Music from Jiggery Pokery, tickets £10, which includes supper - bring your own drink and glasses! Tickets available from Mike Andrews 07932 159817 and Mary McArdle 01228 631358. Carlisle Renewal Days – monthly days of worship, prayer and praise. The next date is October 25th at St Edmund’s Church, Orton Rd, Carlisle from 11am to 4pm. Our speaker will be Fr. Stephen Wright OSB. All welcome. Please join us even if you cannot stay for the full day. Tea and coffee provided, please bring a contribution to a shared lunch. Contact : Janice Wrench -01768 868489. The feast of St. Margaret Mary will be kept with a school Mass at 10.00 am on Thursday morning - all are welcome. 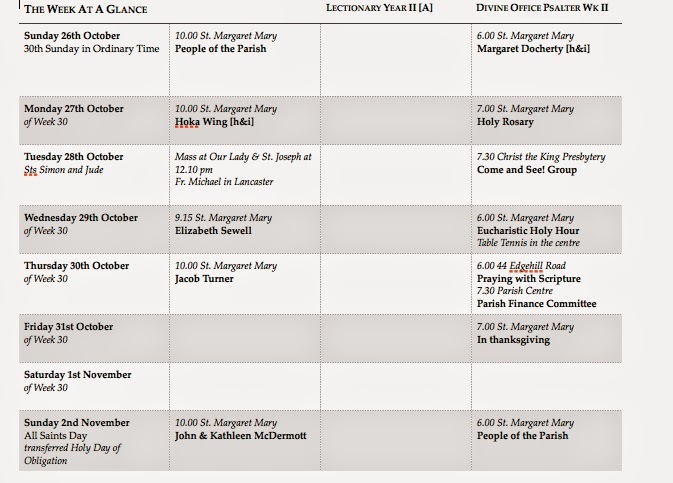 The 10.00 Mass will also be a Mass of St. Margaret Mary. There will be ‘Brunch’ served in the centre after Mass [as a thank you to the Sisters]. All are welcome - please sign the sheet [for numbers]. Christ the King Church is closed for redecoration from Monday 13th October and will reopen on Saturday 15th November. 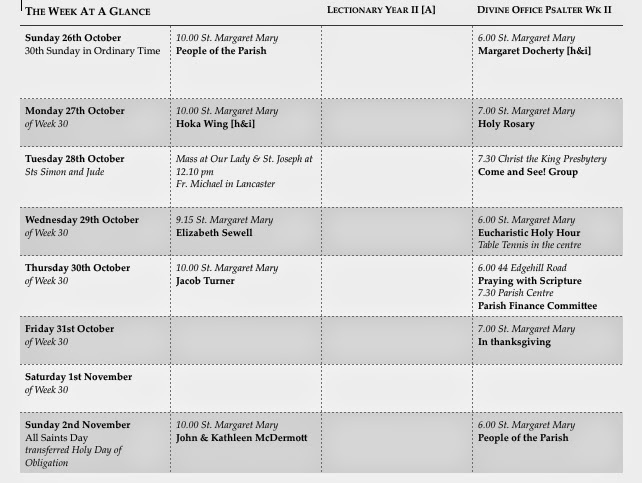 During this period there will be two Sunday Masses [both at St. Margaret Mary] 10.00 am and 6.00 pm. Those requiring transport to help them attend Holy Mass should add their name to the sheet at the back of church. Mass on a weekday will be celebrated at St. Margaret Mary as announced. Help is needed to remove statues and other items from the church on Sunday afternoon from 3.00 pm. A regular evening of spiritual refreshment for men at St Margaret Mary, the second Friday of the month [10th October], and for women on the third Friday of the month [17th October]. This month the subject will be ‘The Call to Holiness”. Christ the King 132 and St. Margaret Mary 97 . Parishioners at Christ the King gave £395.73 and St. Margaret Mary £240.89. A total of £636. 62. Thank you for your generosity. Please note that there will be no public celebration of Holy Mass in the parish on Wednesday this week. On Friday, there is no morning Mass. Sorry for any inconvenience this may cause. The list of deceased parishioners has been been compiled from available records. 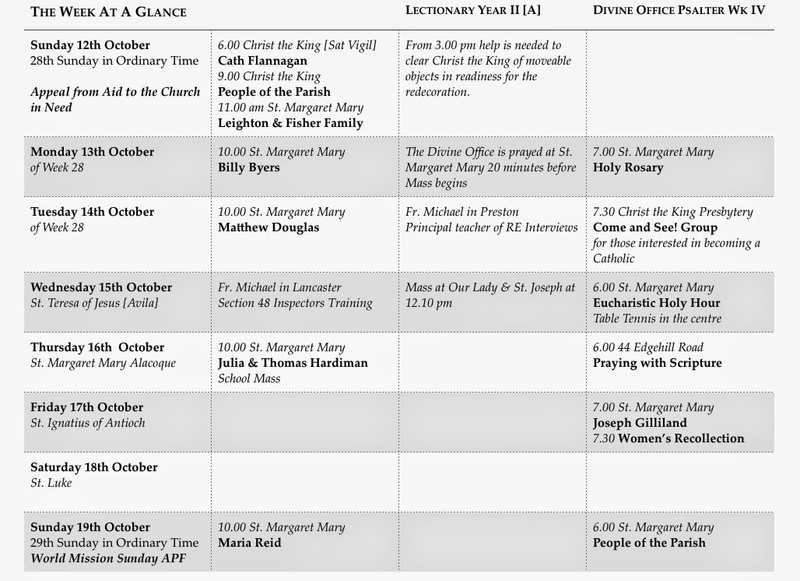 Please check the new ‘Book of the Dead’ [which will be used in liturgies in November] which can be found on the tables in both churches and fill in a slip to correct any omissions or mistakes. There are a couple of duplicate records that need to be corrected. Ballroom dancing classes will resume in the Parish Centre on Tuesday 14th October from 7.30 pm. Come along and have a good time and develop those dancing feet. Good clean family fun with ne’er a blush to a maiden’s cheek! At Our Lady’s on Sunday October 12th at 6.00 pm. The organisers need volunteers to help make the soup and / or help serve food from the van. They plan to go out in the city 7.00-10.00 pm. Demand will determine how many nights they operate. Person to contact: Mark Sellers: 01228 520898 / 522605. Is God calling you to serve as one of His priests? Come and see at the vocations discernment day, Sunday 19 October, 11.00am-5.30pm, Our Lady & St Joseph’s, Carlisle. See the poster for more details, or contact Fr. Darren, 01772-719604, priest@lancastervocation.org, or Fr. John 01228-521509, jwmillar1@gmail.com. The group will meet on Tuesday 14th October at 7.30 pm in the Presbytery at Christ the King. Bishop Campbell has announced that from the weekend of 1st November, St. Ninian’s Chapel in Brampton will cease to be a place of public worship. The Sunday Mass will move to Warwick Bridge from this time [9.00 am]. Christ the King Church will be closed for redecoration on Monday 13th October and will reopen on Saturday 15th November. 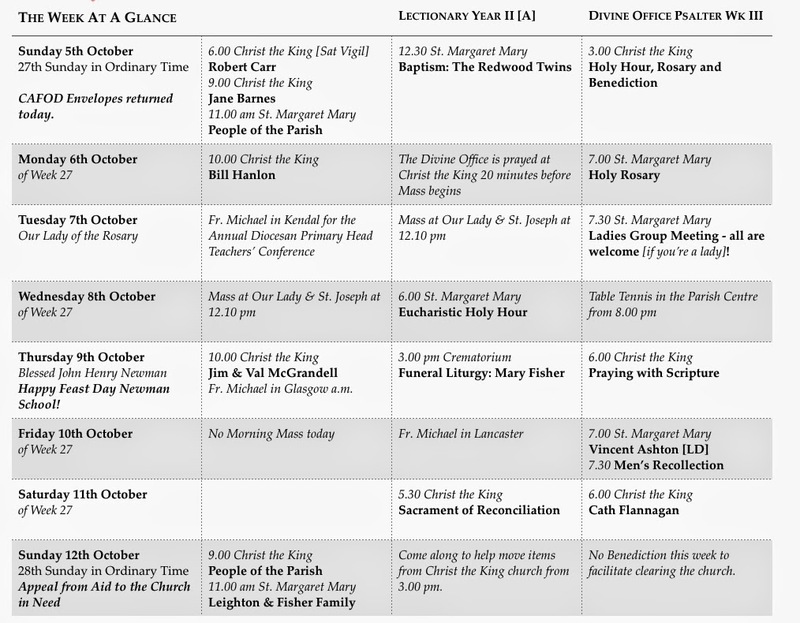 During this period there will be two Sunday Masses [both at St. Margaret Mary] 10.00 am and 6.00 pm. Those requiring transport to help them attend Holy Mass should add their name to the sheet at the back of church. 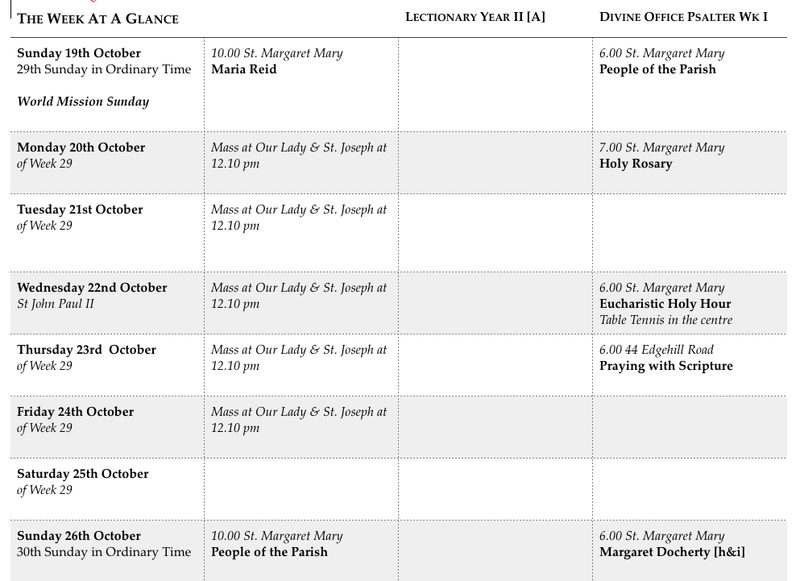 Mass on a weekday will be celebrated at St. Margaret Mary as announced. The Osgood baptism on the 2nd November will be celebrated in the Day Chapel. Help is needed to remove statues and other items from the church on Sunday 12th October from 3.00 pm. Many thanks for all involved in organising the Race Night and for all who attended and supported this event. Parishioners at Christ the King gave £439.91 and St. Margaret Mary £300.47. A total of £740.38. Thank you for your generosity. Please note that there will be no public celebration of Holy Mass in the parish on Tuesday and Wednesday this week. On Friday, there is no morning Mass. Sorry for any inconvenience this may cause. A rumour seems to have developed that Fr. Michael is moving house….he isn’t! Enveloped should be returned this weekend. The list of deceased parishioners has been been compiled from available records. Please check the new ‘Book of the Dead’ [which will be used in liturgies in November] which can be found on the tables in both churches and fill in a slip to correct any omissions or mistakes. There are a couple of duplicate records that need to be amended. Meets on Tuesday evening at St. Margaret Mary at 7.30 pm. All ladies are welcome - this month it’s about ‘nails’. The group will meet on Tuesday 14th October after the 7.30 pm in the Presbytery at Christ the King.